ANACHEEVA (AUS) (Bay 2007-Stud 2012). 4 wins-1 at 2-from 1200m to 1600m, MRC Caulfield Guineas, Gr.1, 3d ATC Australian Derby, Gr.1. Brother to SW Headturner (Australian Derby, Gr.1). Sire of SW Ana Royale (SAJC South Australia Fillies Classic, Gr.3) and of Clean Acheeva, Nacho Libre, Segovia, Scappare, Southern Man, Special Rain, The Housemaid, Heeza Force, Saucy Jack, Acheeva Dream, Kothu Rotti, Princess Anacheeva, Riverlea Honours, etc. Halfblood Prince (g. by Skalato). 7 wins to 1500m, A$118,420, MRC Le Pine Funerals P.
Robbo the Bold (g. by Hold That Tiger). 6 wins from 1600m to 2200m, A$93,416, to 2017-18, Devonport RC Tasracing Off the Track. Robbo's Tee Tee (g. by Tayasu Tsuyoshi). 4 wins from 1200m to 1600m in Aust. Cling Tight (Tong Po). 3 wins-1 at 2-to 1200m, 3d QTC Persian Lyric H., L, BTC Autobarn 2YO H.
Bold Cheree. 6 wins. See above. Honey Ko. 4 wins-1 at 2-to 1050m, A$99,600, 2d BRC Town & Country Plasterboard H., 3d BRC Energy H., GCTC First Up Racing Connections 2YO H., Sky Racing 2 H.
Himalayan Salt. 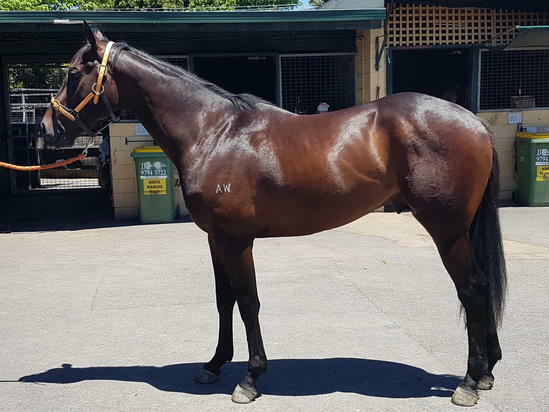 Winner at 1200m in 2017-18, 2d SCTC Stanley River Thoroughbreds 2YO P.
Liker. 2 wins-1 at 2-at 1000m, 1050m to 2017-18 in Aust. Rocket General. 2 wins at 1200m in Malaysia and Singapore, 2d MVRC Toy Factory 2YO P., Singapore TC Graduation H., Class 4 H., 3d Singapore TC Graduation H., Class 4 H.
Chain Tong. 9 wins from 1000m to 1600m in Aust. Safe Landing. 3 wins at 800m in Aust. Armada Gae. 2 wins at 1200m, 1300m in Aust. Producer. Sweet Cheri Pie. Winner at 2 in Aust. Producer. RASS FLYER (Rassendyll). 10 wins-4 at 2-to 1500m, A$224,360, VRC Linlithgow S., Gr.2, GCTC Rothmans Classic H., L, STC Arthur Young Welter H., AJC Royal S., STC Campbell's H., 2d QTC Castlemaine S.H., Gr.1, BATC Tourist Minister's Cup, Gr.3, AJC Hall Mark S., L, Jack Jarvis Welter H., 3d QTC Sires' Produce S., Gr.2, BATC Black Douglas S., L, STC Hurstville Welter H., 4th MVRC Herald Vase H., L.
Orion County. 6 wins-2 at 2-at 1000m, 1200m, BATC Doomben Mini Nugget S., QTC Chelmer H., 2d BATC Wedgwood Freshman S.H., 3d BATC Robins Kitchen Quality H., Tobin Bronze H., Liberal Ladies H., QTC Kippa-Ring H.
Rass Magic. 6 wins to 1400m in Aust. and Mauritius, STC Rocky Mountain Lodge, 2d AJC Chicola H., STC Master Builders 3YO H., 3d AJC 3YO H., NSW Tatt's RC Lou Silk 2YO H., STC 3YO H.
Commendation. 5 wins-1 at 2-to 1200m, STC Hunter Old H., 3d QTC SE Queensland Race Clubs Association H., AJC FW Thompson H., STC Castrol Masterpiece in Oil H., Grace Bros Mothercare H.
Trade n Luck. 3 wins at 1200m, 1400m in Malaysia, Penang TC Tunku Abdul Rahman Anniversary Cup, National Premier Sales S.
Trust in Me. 3 wins at 1200m, 1600m, 301,073Rgt. in Malaysia, Selangor TC WIRA Malaysia Cup, 3d Perak TC WIRA Malaysia Cup, Selangor TC National Stud Farm Silver P.
Aquareine (Latarmiss). 4 wins from 1000m to 1800m, A$92,650, BTC Nationalpubpokerleague.com.au H., QTC Fuji Xerox Pty Ltd H., 2d QTC Jenny Pascoe Memorial H., Aitkenvale Family Health Centre H., 3d QTC Bright Shadow H., L.
Red Icing (Palatable). 6 wins from 1600m to 2500m, CJC NZ Cup Trial H., 2d SAJC Eagle Blue S., Gr.3, 3d CJC South Island 3YO S., L.